Welcome to Garden Bloggers Bloom Day for November 2010! Act III, Scene 3 in my garden. The play is nearly over for this season. The flowers, who are the actors in this drama of seasons, are just barely hanging on, waiting for the final curtain to fall. They have switched from the bright colors of Act II, Summer, to the muted, faded colors of Act III, Fall. They barely whisper their lines now, standing off to the side so that briefly, the brightly colored fall foliage can shout from center stage, before it, too, performs a final scene, falling down on stage, to be swept off by a gust of winter winds, marking the beginning of Act IV and the end of the play. In other words, there is not much to show in my November garden. The only plant I could honestly say is actually still blooming is the Aromatic Aster, Symphyotrichum oblongifolium ‘October Skies’. Even the rose pictured above, Rosa ‘Radsunny’, isn’t really blooming right now. It is more frozen in time and will wait in that state for the winter snows to finally knock it down. 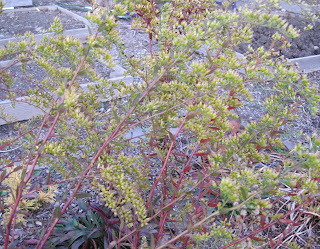 Everything else is merely seed heads including the Tall Sedum, Hylotelephium telephium. I still laugh when I think of one of the common names of this plant – Witch's Moneybags. I look at the flowers and can not imagine where that name came from. 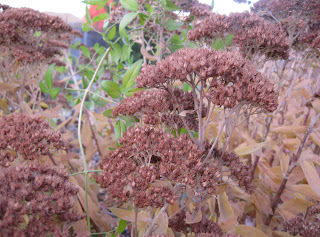 Another plant that I will leave the seed heads on this winter is Short’s Goldenrod, Solidago shortii. I have no idea if this seed will be viable, but I hope that it is and that the plants produces dozens of seedlings, which I will gladly share with anyone who wants to grow this beautiful, rare goldenrod in their garden. It is wise to never reach an ending without a new beginning. 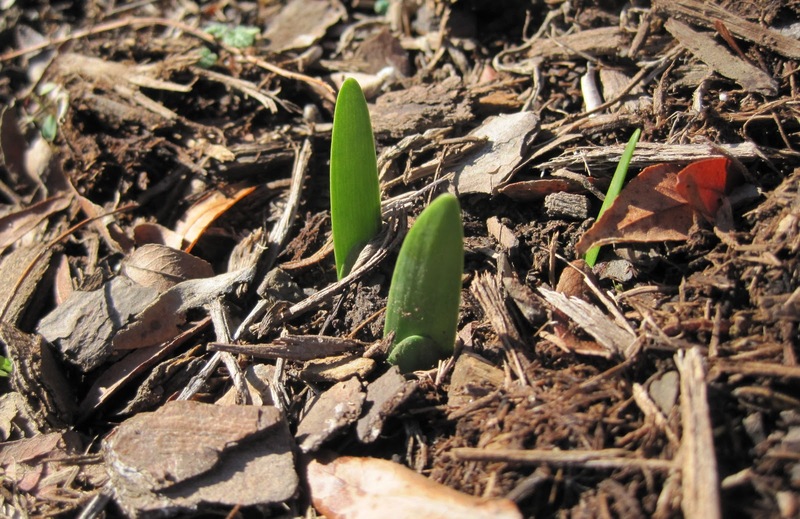 Thus it is fitting that as I wandered the garden in search of the last blooms before the final curtain call of the season, I found these sprouts of what will surely be some of the first blooms next spring, when we begin again with Act I, "Spring, A New Season". What's blooming in your garden on this fine November day? I hope you'll join in for Garden Bloggers Bloom Day by posting about what's blooming in your garden on the 15th of the month. It's easy to participate! Just post about what's blooming in your garden, leave a comment below to tell us a little about what we'll find in your November garden, then leave a link to your bloom day post in the Mr. Linky widget below so we can find you. I like the faded fall look. It's suitable for a more contemplative time of year. I hope to have a display of asters next fall, like you. I just planted a few. witch's moneybags - that's so random! I love the muted colors. I planted so much pink I didn't think fall would feel right, but sure enough, the pinks are gone, replaced by red, gold, orange and yellow. It's gorgeous. THis time I posted my blooms along with those from the chrysanthemum show at Brookside Gardens. Radsunny has been a fantastic performer for you Carol, and wow, October Skies is looking great well into November - what a wonderful aster. Happy Bloom Day, and thanks for hosting! Beautiful blooms! happy blooming day! I get a little melancholy this time of year, when the cold wind blows and I have to put away the last of my pots and outdoor chairs. Luckily, all my Christmas Cacti decided to celebrate early this year to cheer me up and put me in the holiday spirit. Hi. I've been lurking for a few months and I'm joining in for the first time. Just as well I took the photos a few days ago, the weather is back to grey and gloomy again. Carol, your Act 3 still has its own charm. Thank you very much for hosting GBBD. I am so happy to see flowers everywhere, no matter what season they are in. Cheers! Hi all and welcome Mac. I'm from down-under too, only across the ditch. I have to say it makes me kinda sad to see all those northern hemisphere gardens going into winter so I guess we southerners need to cheer them up a little with a few blooms. Love your fall flowers. I hope I find some blooming in my garden in the morning.I know some of my spring flowers are trying to show their heads. We need a cold winter to slow them down. I have been reading your blog and finally figured out how to link. Carol I'm intrigued by the name witches moneybags. I have 2 roses just sitting there like yours and I've just realised that I forgot to mention them on my post. I wrote the post yesterday and as I look out the window this morning I think they have gone as we had our coldest night and everything is white here. A bit sad looking at your once lovely garden whats left are just faded flower heads.But actually its time to rest for you and the plants so that Spring will have you both come back energised and with abundance of new life! Happy Holidays! Act !!! 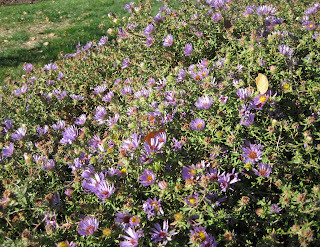 is still fine for Fall.Thanks for hosting GBBD and the aster is still blooming here as well. I love the picture of the sprouts -they add such a contrast to the preceding pics of fall flowers. My first GBBD post is of my potted plants on my patio. I refer to them fondly as my potty ladies. Have a look at them when you can. Happy Bloom Day, all! There's not much going on here in southeastern PA, but I managed to find enough for a quick post at Hayefield. I hadn't heard the common name "witch's moneybags" before for a sedum, but I vaguely remember a name relating to purses for some sedum: something to do with being able to inflate the leaves if you blow into them or pop them open if you squeeze them? Not a very big purse, though - more appropriate for fairies, perhaps? Happy blooming day everyone - thanks Carol! Greetings from across the Pond: I have been really enjoying your series on Happiness in Your Garden. Very much food for thought! Yes, your cast sounds as if it could use a rest, but perhaps the director can through herself a celebratory wrap party. Thank you yet again for hosting GBBD. Hooray for next spring's shoots! The garden is definitely heading toward winter hibernation, but I am cheered to see my lavender and Bonica roses still blooming madly, even after a couple of frosts. Thanks so much for hosting GBBD. I love seeing what is blooming in everyone's gardens! Happy bloom day from Austin. 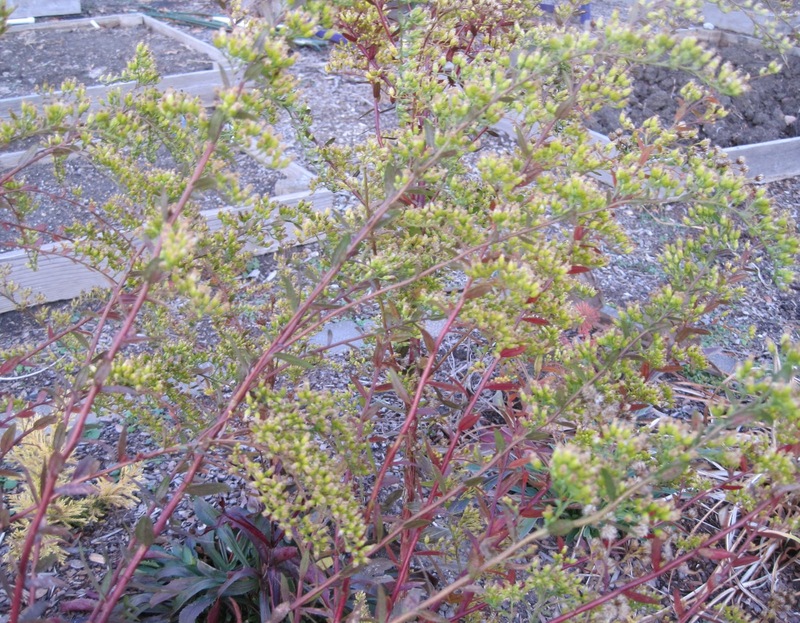 I've never heard sedum called witches' moneybags. That is strange. My ex-aster 'October Skies' finally gave up blooming last week, but I still have two other plants that are ignoring the calender. The roses here are still going, too ... not as good as earlier in the year, as one would expect, but there are enough to enjoy in the garden AND bring into the house. My goal each year is to have roses on the table for Thanksgiving. Not sure I'll make it this year. My roses are just like yours, and I don't even have any asters blooming. But, much to my surprise, I have two plants blooming that just started--they weren't blooming last month! You still have so much bloom in the garden! Up here in the higher elevations of Mass. the garden is almost totally asleep. I do love to hear about colorful common names of plants. Sometimes, like witches moneybags, they are so mysterious. I was just reading about that goldenrod! I'll be watching yours to see if they reseed. Thanks again for hosting and happy GBBD! I like your way with words, Carol. Yes, those of us above zone 6 are near the final act in our gardens for the year. I have a few blooms that are persevering. I love the way you compared the season to the scenes of a play. Definitely in the same act here with more leaves than flowers. And I just found some species peony buds trying to poke their heads up! I love your four-act play, Carol! Even your rose looks like it's bowing for the last curtain call. I am hoping for that same look soon. I would really like to put the year to bed and have a break! I want to think about next year, as I am sure your peaking bulbs are making you think. Happy Bloom day. "Remnants" seems to be a bit of a theme for lots of us at the moment Carol! How wonderful to see the green shoots of next Spring already. I get excited by the buds on my Magnolia stellata for the same reason! Happy GBBD, I'm off to peer over the garden walls of as many other gardens as I can before getting down to some work! I like the name - Witches' moneybags, although I can't imagine how the flower got the name! Thanks, Carol. Lots of seed pods and the last of the sedum in the garden but i refused to photo that. Too depressing. I went with the Christmas cactus blooming merrily inside! I love 'Radsunny's' sleepy head. A beautiful final act. Snow is forecast so here, too, the show will end very soon. My post is up. I'll check Mr. Linky later. Thanks, Carol, for hosting my favorite meme once again. What a random common name! Thanks for hosting! Word is that witches moneybag was used in the rituals of their spirtual world, Carol, thus the name. I've got my GBBD post up. Enjoyed reading about your Act III. My first bloom day - luckily there are a few flowers that haven't faded or been run down by the dogs! Nice post. Can't believe Act I is already on its way in your garden! I did a quick round for GBBD in my garden today but didn't really look for signs of spring yet. The bulbs are probably covered by fallen leaves but I'll have a closer look tomorrow. It would be great to have the small signs of spring in my garden already! I am new to garden blogging and just found out about Garden Blogger's Bloom Day. Luckily, I had a post ready with photos of November highlights from my garden. If you check it out, you will see fall-blooming snowdrops, camellias, hardy cyclamen, Disanthus, and arum, among others. I hope you enjoy it and leave a comment. Thanks for organizing this---I can't wait for the challenge of December! I love how you described the flowers as a play and that they are barely whispering their lines now. I think these last few flowers are always the most appreciated of the year since we never know how long it will be before we see them again. I love that you're looking for signs of the next season too! I noticed my sedum (or rather make that Witch's Moneybags!!) starting to poke out the new growth for next year. It gives me hope for making it through the winter months and all their grey. It's definitely not quite curtains yet here at Blithewold. Any day now the fat lady's bound to sing... Spring sprouts already in your garden? - I'm going to have to go on another hunt around here! Thanks, as always for hosting GBBD! Happy bloom day Carole. My garden is covered in snow so I'm looking inside for inspiration. There is still a bit going on over at The Havens, but it is not surprising since we are quite a bit south of you. I like the look of this time of year, as the leaves carpet the ground on their way to mulch. If you are making notes of it, I would really like to have a couple of those rare goldenrod seedlings when they are ready. I think they would like the Petite Prairie. Love the goldenrod and asters, an uncommon sight in SoCalif, so I'm really enjoying the November bloom day posts. What eager little daffys (if that is what they are?)! That is a hopeful sign. I am enjoying the frosted, dried flowers of last month, and a few lone violas. 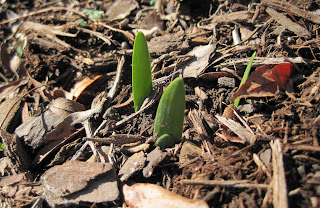 I love that you, too, found spring bulb sprouts inspiring on this autumn day! I'm looking forward to the foliage taking center stage in my garden too. That Goldenrod does look interesting! A bit late in the day... but hey! I'm in! And I enjoyed your post tremendously. Thank you for sharing your garden. We share some of the same plants.I am especially fond of asters this time of the year. On the sunny side of my shade garden I hope to add more between my deciduous hollys. Excited to see a few blooms still giving color to my garden this late in the season before the fall foliage takes over. Thanks for hosting GBBD, Carol! Looking forward to seeing what's blooming in gardens across the country. That end of the year makes me look at the dried flowers and observe their beauty. I fear your bulbs may be doomed if already sprouting.I add every year, over 300 this year. Fall really makes up for the coming of winter (ugh). It's also a nice reminder of what's coming in spring! The soft colors in the garden now are so relaxing---perfect for this season of "nesting"! My garden is much the same. One lonely protected mum showing a bit of bloom. This is the final bow for this year I am afraid. Thanks again for hosting Bloom Day. Fall does have it charms that even a diehard winter hater like me must acknowledge. A garden getting ready for its winter sleep does have a unique loveliness. I'm actually shocked how much I still have in bloom! Can't wait to browse everyone else's blooms, too. Still looking OK here, in between your chilly Z5 and the winter-less climes >Z9! But *this* weather! Can't wait to read the zillions of other bloom day posts! Hmm, I might be interested in some of that goldenrod... I'm glad to see you have some bulbs coming up. So do I but it just seems too early to me! Hi, Carol! It seems that spring is already wrapped, and it is time to shipping sooner or later. Or am I just dreaming about it? Anyway, I've also found some signs in my garden this afternoon. Thanks again for hosting, Carol. I, too, mostly have fading blooms. But that's okay--it's the right time of year to feel a weird combination of faded and invigorated. Love the way the true fall-bloomers like asters can really make your day when everything else is on its way out. And I like your preview of Act I for next year. Thanks again for hosting GBBD! My November Bloom Day post is up. I can't believe the year is almost over and there is only one more GBBD left for this year. I see that I am not alone in having "not-a-lot" in bloom. Though So Cal is pretty warm all year long, and we have had some rains, this is a quiet time for flowers in the garden. Still, it's a very busy time for gardeners in the garden. Thanks for keeping the GBBD going, Carol! Act III, Scene 3 was canceled in my garden today due to cold wind and rain. So I cheated and recycled blooms from a former garden far away where it is most likely warm and dry. Both blooms and foliage are glowing with autumn light in my garden. Hope you'll come by and take a look. It's November already and I still see blooms everywhere, much more than frost. Thanks for holding GBBD. Your asters make me wish I'd gotten my little pot in the ground, before they shriveled up and died. Sob! Serves me right for buying plants I don't have time to put in the ground. Happy GBBD! The Radsunny even looks good after being freeze-dried, Carol... it sounds as if you chose well. With the end of the outside plants, guess we'll be seeing bloomdays from Carol's Compact Conservatory next month? My November GBBD post is up here, and the list of botanical names is here. Hi! This is my first month participating and I am happy to share the few plants that are blooming in my garden. 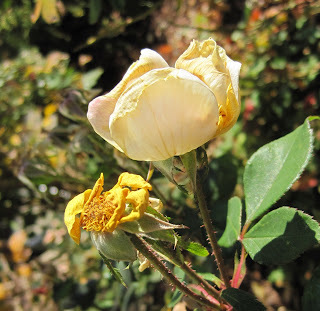 I like that you photographed even the fading blooms - so real in the garden this time of year. I just found this link right after the date changed on the east coast, but it's still bloom day over here in San Francisco! I had just posted about fall colors out here, which are all garden blooms, so it was serendipitous. I look forward to checking out all the other blooms! Wendy/AKA The Lazy Composter in San Francisco. An impressive turnout for bloom day as always. I reckon that aster is pretty good, worth five June or July flowering shrubs. And you're right about the witch's moneybags. Sometimes I think people deliberately made the most random common names they could find. Anyways, thanks for hosting. I thoroughly enjoyed looking at all these links and seeing what everyone has in the gardens in November. It's rainy and bleak today (but thank goodness -- it's been droughty!) and all these photos make me feel like it's the start of the growing season. Thanks for all the eye candy! Sorry for the duplicate post...newby here. I'm glad I stumbled across your monthly Bloom Day postings. I too have watched so many plants in my garden move onto phase III but take heart, spring will come again. Here is a poem I love. I love the rose frozen in time. I saw a canna lily here in MN the other day and the leaves still looked green, crazy! Not many blooms here in MN in November. I love the ones that I was able to post though...such cool blooms and some of my favorites. Two days late, but I finally got my post up! Thanks again for the motivation to document the garden's progress through the seasons. It was a wonderful show, Carol, and I enjoyed each act. Your 'Radsunny' has performed beautifully and makes me want to add it to my garden, as well as 'October Skies', which still looks pretty. Daffodil shoots at this time of year? Now that's amazing! Happy (late) Bloom Day, Carol. hi carol! here's hoping you get the encore or intermission you were hoping for! bravo. Just got around to posting my GBBD, better late than never. I was sick for two weeks, and I was originally not going to post, but I couldn't resist - even though I'm almost a week late! Thank you for hosting! I was betting on the seedpod rather than the flower being the cause of the name, but Wikipedia says you can make witches' moneybags by separating some of the layers in the leaves. I don't find common names to be peculiar -- there is always something behind them, even if it's a children's pastime as in this case. Sorry I missed garden bloggers bloom day. I love the drama of seasonal change! See "How is gardening like politics?" Love your site! I just entered the blogging world and it's nice to know there are other gardening fanatics like me! Bloom day--just learned about that.. I'll participate next month though I might have to be a little creative in January!